The Landing Craft Mechanised (LCM) Mk.III was the most widely used of the LCMs during World War II, with more than 8,600 being built in yards in the USA. They were employed by both the US Navy and the Royal Navy. The LCM Mk.III was extensively used in operations in the European and Pacific theatres from 1942, with many hundreds taking part in the "D-Day" landings in Normandy in June 1944. The Sherman M4A2 Tank was the best-known of all American medium tanks. 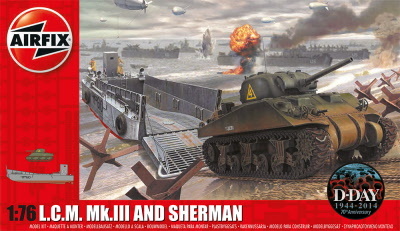 The Sherman was designed in 1941 as an improvement on the earlier M3 Lee and Grant series: after initial production in 1942, large numbers of Shermans were issued to the British Army, and the type became the standard Allied medium tank. Powered by ShopFactory to sell P2208 online. All-in one eCommerce and online shopping cart software.